At L & M Motors in Athens, we research our vehicles carefully so that we can provide our clients with accurate information about the trucks in our inventory. The Ram 3500 is a top pick with consumers because it was manufactured with a broad range of features. These include exterior features that are innovative and enhance performance efficiency. 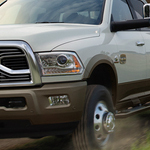 Wheel-to-wheel side steps are an available exterior feature with the Ram 3500. The wheel-to-wheel side steps make it easy to access the truck bed, and the tubular design of the steps increase performance efficiency. The class-exclusive RamBox Cargo Management System is featured with the Ram 3500. The cargo box is drainable, secure, durable, and lit, and you also get a cargo-view camera, a ParkSense Front and Rear Park Assist System, LED bed lighting, and a ParkView Rear Back Up Camera. You can also choose the AllSecure Central Locking System that allows you to lock and unlock the cargo box with the push of a button.